Scientists agree on climate change. So why doesn’t everyone else? Here’s a finding that shouldn’t be all that surprising: Since 1991, roughly 97 percent of all published scientific papers that take a position on the question agree that humans are warming the planet. That stat comes from this extensive new survey led by John Cook and Dana Nuccitelli, who run the Skeptical Science website. And it builds on earlier studies finding the exact same thing. Fair enough. But it’s worth asking: What’s the point of this exercise? After all, it’s not news that climate scientists agree that fossil-fuel emissions and land-use changes are causing global temperatures to rise. The last big report from the Intergovernmental Panel on Climate Change said as much. And these surveys can’t answer the hard questions that do provoke real disagreement, like how much warming we can expect, or what to do about it. The reason our paper is particularly important is because research has shown there’s a strong correlation between public awareness of the consensus and support for climate mitigation. 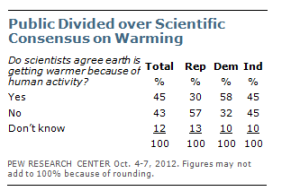 However, the public is very misinformed on the issue, with the average American believing that scientists are split 50/50 on the cause of global warming. So it’s critical that we close this consensus gap. That said, other experts are doubtful that emphasizing the consensus on climate change will actually sway public opinion here. Dan Kahan of Yale Law School points out that we’ve seen plenty of these “consensus” surveys over the years — to little effect. In fact, he notes, there’s some evidence that hammering away at the science doesn’t always get everyone to agree. If anything, it can make people even more polarized. Over many years of research, we have consistently found that, on average, Americans view climate change as a threat distant in space and time–a risk that will affect far away places, other species, or future generations more than people here and now. “That. Is. The. Stumbling. Block,” says Kloor. So where does that leave things? 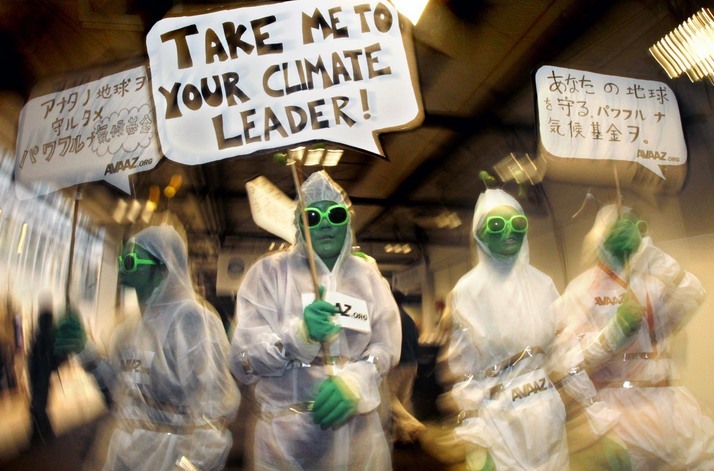 In recent years, science communicators have tried to dream up all sorts of novel ways to talk about climate change. Kloor, for his part, suggests a “frank debate about future uncertainties, risks, and scenarios, and the reconciliation of competing values.” Grist’s David Roberts has suggested elsewhere discussing the topic in terms of values rather than endless lectures on scientific facts. Either way, there does seem to be a fair bit of skepticism among science communicators that yet another study reiterating the expert consensus on climate change will change many minds.